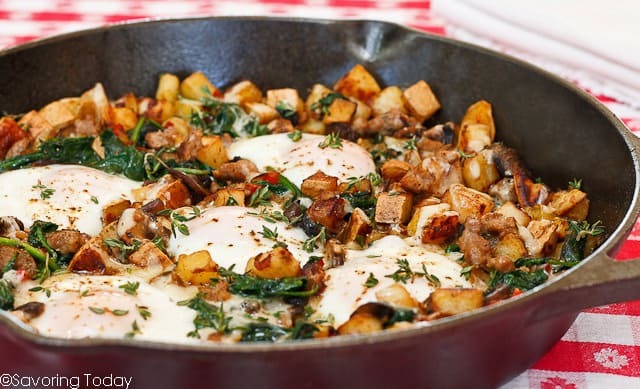 This Savory Breakfast Skillet didn’t make the final cut for our Serve and Savor Cookbook even though it’s a go-to weekend breakfast around here. Too good to keep to myself any longer, I’ve set the table for breakfast and you’re invited. I need everyone to show up on time because it tastes best when fresh out of the oven. My favorite part is watching the yolk meander and mingle once it’s safely corralled on my plate. That pretty much gets the day off to a great start. I hope that was funny and not weird. We watched that movie last week and I just had to work it in somewhere. It’s an oldie but a goodie. loaded with hearty sausage, sweet potato, mushrooms, peppers, and sunny golden eggs. 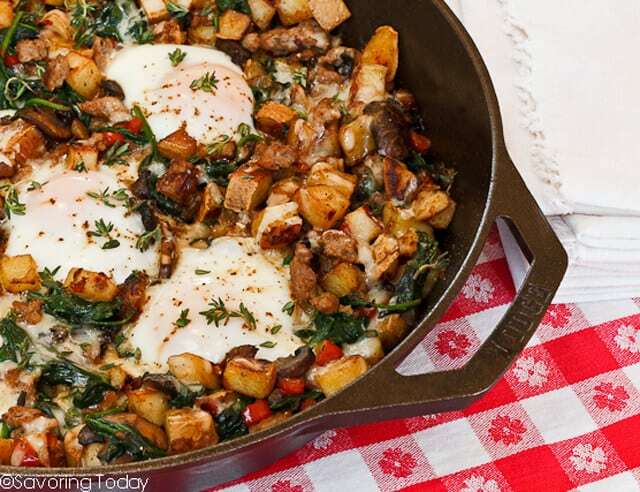 A savory breakfast skillet loaded with hearty sausage, sweet potato, mushrooms, peppers, and sunny golden eggs. Heat oven to 350°F. Brown the sausage in a 12-inch cast iron skillet until fat is rendered and sausage is crumbled and cooked through (if cooked in patties, crumble with your hands once cooled). Transfer to a plate and set aside. If less than 2 tablespoons rendered fat remain in the skillet, add coconut oil and cook the sweet potato over medium-low heat, stirring frequently, until browned and tender, 10-12 minutes. (Even if you start with a little fat from the sausage, you may need to add coconut oil if the pan becomes is too dry.) 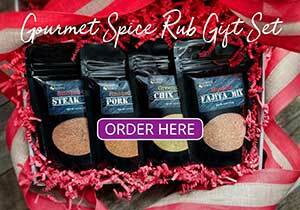 Transfer to a plate and season with salt and pepper. In the same skillet, saute the onion and bell pepper in the butter over medium heat until softened, about 8 minutes. Add the mushrooms, garlic, and thyme; continue to cook until the mushrooms wilt, about 3 minutes. Stir-in the spinach and cook until the spinach wilts. Add the crumbled sausage and potatoes back to the skillet, stirring to blend the ingredients. Sprinkle cheese over the top and make 5 small pockets for the eggs. Break 1 egg into each pocket. Season eggs with salt and pepper. Bake for 10 to 12 minutes or until eggs are just set. Serve immediately with fresh thyme and chopped tomatoes and to garnish. To save time, use leftover grilled or roasted vegetables, potatoes, or sausages. This looks so delicious, The perfect breakfast to start the day! This is wonderful! So good! I didn’t have any spinach on hand, so I used finely shredded cabbage and cooked it with the sweet potatoes in that phase of the recipe. Absolutely the best skillet I’ve tasted in a long time! Hi Amanda! Thanks so much for taking the time to come back and let me know how much you liked the recipe. 🙂 That makes my day! This breakfast sounds delicious! I love that you’ve cooked it in healthy coconut oil!! What about Bob? That was funny and not the least bit weird. 🙂 Now this is a breakfast!! I’ll be going on vacation with 3 hardy men in a few weeks and I can see making this for them one morning. I want to come over for breakfast right this minute! I love everything about this dish.